Artist Rachel Barbaresi invites you to take part in her micro-residency at the University, as part of the ‘What is Public Art?’ series of activities this March. Rachel will lead a series of creative research walks in the campus grounds, exploring their potential as spaces that invite university members to be outside their normal frame of reference and encounter new connections. She will then create a pop-up ‘studio exhibition’ in the Cole Museum, inviting further interaction from visitors, through creative responses to found items and considering different ways of categorisation and display. Each participant will be given a set of tools and materials for drawing and recording data. Guidance will be offered, but participants are invited to invent their own approaches to working with the tools and selecting data to record. Activities may include drawing, taking impressions using plasticine, photography, collecting (sound recordings, found objects), measurements and estimates. Rachel then invites further visitors to join her in curating the archive of drawings, which will take place during a ‘studio exhibition’ at the Cole Museum. Visitors will have the opportunity to respond to the archive through creative activities including monoprinting, casting in plaster, drawing, written reflections and creative writing. Guided by Rachel, visitors may also consider different approaches to categorising, displaying and interpreting the found and created items in this museum setting. The studio exhibition will take place at the Cole Museum, during the day on 21 and 22 March and visitors are welcome to drop by for a short or longer period of time. If you are interested in attending the studio exhibition at the Cole Museum, please email Miranda on m.c.laurence@reading.ac.uk to register your interest and you will then be sent further information about how to take part. Or you can drop in on the day. Rachel will also invite responses to the research at the MERL Late event on 14 March ‘More Than Human’; to book for this event please visit the MERL website. Rachel Barbaresi’s previous projects have involved a range of approaches to participatory practice including reminiscence, working with archives and making. Taking urban spaces and architecture as starting points, her approaches to collective research incorporate the diverse voices of participants and a socially situated reading of place. We are seeking to engage a freelance artist or creative designer to develop existing or new artwork which engages with one or more of the themes of Biodiversity, Urban Environment, or Climate Resilience. The artist will develop interactive, multi-sensory work and will design and deliver five interdisciplinary ‘Challenge Days’ centred on the artwork for pupils aged 11-16, and SEN students. These will be delivered at the Museum of English Rural life between 17-30 June. The artist will be invited to collaborate with selected researchers from the University of Reading, primarily working across discipline areas related to our Environment theme. This project is co-delivered by the Arts Development Officer, and the Impact Officer (lead for the Environment theme), with support from the Student Recruitment and Outreach Office, and from MERL. Support from all these areas will be available to the artist throughout the project. The project has been made possible through funding committed via the University of Reading’s Access and Participation Plan. It’s strangely mesmerising, cutting and sticking. Particularly the cutting out part. You find yourself drawn into the smallest focus of outline on the paper that you’re cutting, on the way the blades of your scissors can turn into sharp corners. It also induces a cramp in my hand. As I rest and shake it out, I consider how long it’s been since someone has sat me down in front of glue, paper, paint, scissors and drawings and told me to make a collage. The attentiveness of focus is a common thread that has linked the activities during the two-day workshop that I am running in collaboration with Andrew Mangham, co-director of the Centre for Health Humanities here at the University of Reading. 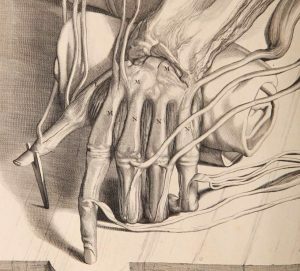 We chose two beautiful early modern anatomical textbooks from the Cole Collection as our centre piece – Vesalius’ De Humani Corporis Fabrica, of 1543, and Govert Bidloo’s Anatomia Humani Corporis, from 1685. These books sit weightily on a central table in the middle of the room, showing off their extraordinarily detailed drawings of semi-dissected human bodies. We constructed this workshop to invite people to apply their focus to these texts in unusual ways. Our core participants are five artists working in different art forms: Eleanor Crook, a sculptor and anatomical artist; Fiona Millward, choreographer and Rolfer, Kelley Swain, a writer specialising in medical humanities; Simon Hall, artist and doctor (and dentist), and Agi Haines, a designer and artist. Each of these artists was invited to lead an activity in response to the anatomical textbooks, inviting us in from different perspectives, different ways of knowing, seeing, hearing, moving and touching. The collage session is Eleanor’s, the final one of the two days, and there is a satisfying sense of glee as we get to work on photocopies of some of the more gruesome engravings of dead people that were taken from both books. As my focus centres on the intricate details of these artworks, I notice a completely different appreciation for the work than I’d had in previous sessions, whether that was moving my own body and responding to the pictures of the human body’s muscles, spine and organs; or listening to myself and others reading aloud poems that make our tongues writhe around unfamiliar words and startlingly emotive images. 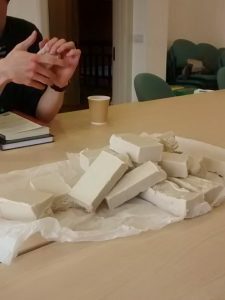 Simon previously led a session in which we were invited to play with lumps of modelling wax while he read passages from a memoir about the experience of blindness. Many people closed their eyes and let the sense of touch guide them. During the two days, we welcomed different academics and staff members into the room to join us in discovering these different perspectives on our collection items. We banished the Powerpoint presentation in favour of occupying the room in different ways, talking in small clusters, sitting on the floor, clearing the tables away to move around. We gave time for conversations to meander, and sometimes tail off; for anecdotes to be shared and offside connections to be made. Themes emerged around (multi-)sensory perception; medical narratives; truth, fakery and authority of knowledge; the dark delight of the macabre, and much more. 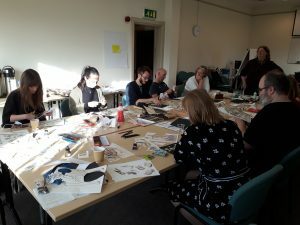 The workshop was a pilot ‘Creative Action Lab’, supported by the Heritage and Creativity Institute for Collections, and so we were keen to experiment with a new method of sharing ideas across disciplines. As a Health Humanities event we welcomed colleagues from English, History, Pharmacy, UMASCS (Special Collections), Art, Typography, Psychology. Those who attended welcomed the slowness of this type of discovery, allowing for questions to be asked, contrary to the often more outcomes-focused pacing of such events. We are now exploring continuations of this approach and some emerging themes. 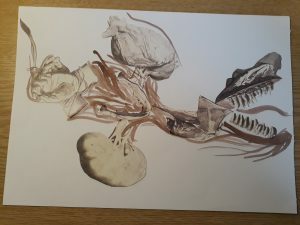 We are thinking of pairing artists with academics in different disciplines to follow up ideas about the relationship between doing (or making) and thinking, taking inspiration from the great early anatomists, and illustrators of anatomy, who paid such close attention to detail in their pursuit of new knowledge to help cure disease. The PER[form] space is a temporary wooden structure sited on the main campus, designed and built by second-year architecture students, in collaboration with the School of Arts and Communication Design, who acted as the ‘client’ in this replica real-life architectural brief. Students also worked with the School of Architecture’s academics, Piers Taylor of Invisible Studio, and Charley Brentnall of Carpenter Oak. 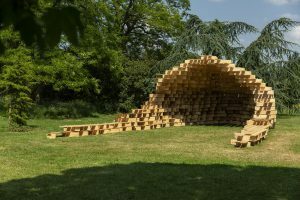 The structure was built in just three days, and was then the home of a programme of varied activity by students from the Department of Film, Theatre and Television, and the ‘Lunchtime Encounters’ programme led by the Arts Strategy. Over two weeks, University staff and students were invited to visit the structure over lunchtime, encountering a variety of ideas, activities, knowledge and discussions drawn from across the University’s activities. These ranged from a performance of musical saw playing, to introductions to our campus museums, from provocations about food wastage to an insight into essential oils. Find out more about what happened during the Lunchtime Encounters programme by scrolling through the slides below. You can also watch a documentary video about the process of designing and building the structure. Did anyone notice a greater than normal occurrence of students wearing hi-vis jackets and hard hats recently? Did you hear the noise of hammering drifting through the trees as you enjoyed the sunshine-drenched routes across campus? Did you glimpse a wooden structure gracefully rising between some of our beautiful trees on the Meadow? Has your curiosity been piqued? This is your invitation to come closer. Smell the pinewood scents as you approach. Listen to the sounds of nature, and watch shafts of sunlight falling through the honeycomb of the per[FORM] structure. What might you encounter when you come? Every lunchtime between 12-2pm, from Monday 4 June to Thursday 14 June (weekdays only), all members of t he University community are invited to drop into the per[FORM] structure for a programme of eclectic activity. Prepare to meet people you don’t yet know; to encounter new ideas, to touch and hear, see and smell. You can drop by for 5 minutes or stay for two hours. Have a conversation; listen to the birdsong; take time to see your surroundings in a new way. The Lunchtime Encounters programme initiative is part of the University’s new Arts Strategy and aims to bring people across the University together. You are invited to interact or experience imaginative and creative windows into some of the ideas, activities and events that stem from our researchers and students. Bring a picnic, come along, see what’s going on. Feed your curiosity – what have you got to lose? It’s quite difficult to describe the frisson that went around the room as everyone realised that in front of them, to look at and indeed touch, were original copies of some of the most famous books in medical history. 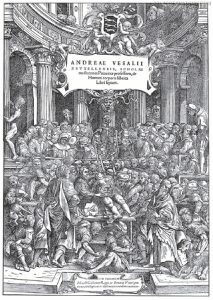 Full of painstaking engravings illustrating the very minute details of the human body in all its layerings, the copies of Vesalius’ De humani corporis fabrica and Bidloo’s Anatomia Hvmani Corporis provided a huge source of fascination for the artists and scholars gathered for an afternoon’s workshop, jointly organised by the Health Humanities Research Network, and the Arts Development Officer as part of the University’s arts strategy activity. 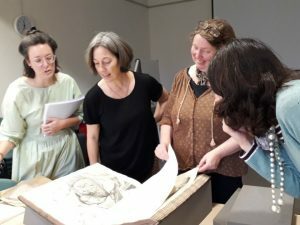 We invited four artists from different disciplines, with an interest in medical humanities, to join the director of the Health Humanities Centre Andrew Mangham, University Art Collections Curator Naomi Lebens, Research Officer: Cole Collection Verity Burke, and Arts Development Officer Miranda Laurence. The artists were Simon Hall, doctor, visual artist and dental trainee whose work explores art and medicine collaboration; Fiona Millward, a dancer, teacher and choreographer and Rolfing practitioner; Kelley Swain, a writer of science poetry and literature reviews, and teacher of medical humanities; and Eleanor Crook, a sculptor with a special interest in mortality, anatomy and pathology who exhibits internationally in fine art and medical and science museum contexts. Naomi Lebens and Verity Burke began the session by introducing us to chosen items from the University Art and the Cole collection, respectively; the theme of ‘movement and stillness’ underpinned their choices. Our discussion ranged from the different visual and haptic interactions experienced when dissecting preserved body parts as opposed to conducting an operation on a live person; to how the illustrations of dissected bodies in the two anatomical text books varied from classical to grotesque, and what effect that had on the viewer; to how sketches of performing dancers related to a drawing of a woman on her death bed, and a woman mid- conversation.